Milena Kunis, professionally known as Mila Kunis play, is an American actress. Her television work includes the role of Jackie Burkhart on That ’70s Show and the voice of Meg Griffin on the animated series Family Guy. In 2010, she won the Marcello Mastroianni Award for Best Young Actor or Actress at the 67th Venice International Film Festival for her performance as Lily in Black Swan. She was also nominated for a Golden Globe Award for Best Supporting Actress and a Screen Actors Guild Award for Outstanding Performance by a Female Actor in a Supporting Role for the same role. Has Mila Kunis had a Nose Job? No doubt Mila Kunis is one smoking hot actress, but we wonder if she has always been this hot or if she paid a visit to the plastic surgeon to look this good! Mila Kunis has been getting alot more face time sense her movie Black Swan came out and it looks like she will probably be getting more spotlight in the future to. 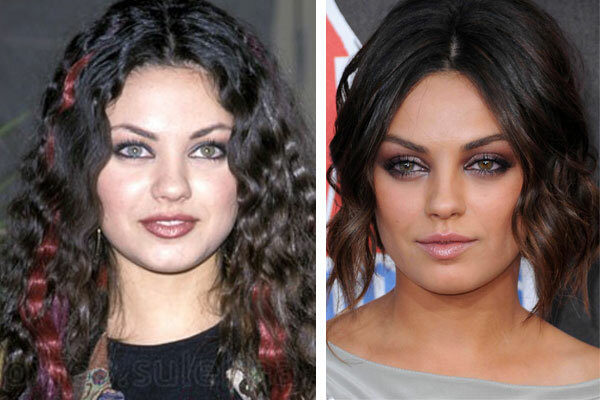 Upon examining the before and after pictures we can tell that Mila has lost a significant amount of weight which makes the appearance of her face is much thinner. In addition her nose is looking slimmer as well, but that is due to the use of contouring makeup. All in all, we do not think Mila has undergone a rhinoplasty procedure. What do you think, has she had plastic surgery?